A steet vendor sells merchandise. Preparations for the tournament have been overshadowed by the attack on Togo's team. (CNN) -- Togo's national football team are on their way home, two days after a deadly attack on their team bus at the Africa Cup of Nations in Angola. Television pictures of the squad and officials leaving their hotel in Cabinda were aired on Eurosport and showed a number of leading players, including captain Emmanuel Adebayor arriving at the airport for the flight home. Earlier, Togolese Prime Minister Gilbert Houngbo told the west African country's news agency that the team "must return" after the ambush by gunmen left an assistant coach and the squad's communication officer dead. At least seven others were injured in the attack which occurred Friday in the enclave of Cabinda near the border with the Democratic Republic of Congo. They included goalkeeper Kodjovi Obilale who is in intensive care, a government spokesman told the news agency. "We understand the wishes of the players... but it would be irresponsible of the authorities in Togo let them continue," said Houngo, who has declared a three-day period of mourning following the attack. Togo's players, who had initally indicated a desire to withdraw from the tournament, decided Saturday night that they wanted to participate after all, striker Thomas Dossevi told CNN. The team were due to play their first game against Ghana in Cabinda on Monday. 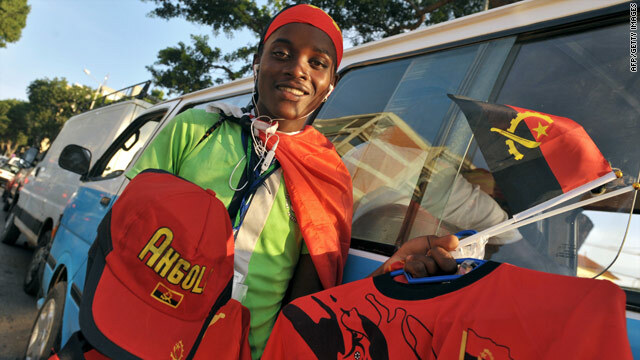 Dossevi said the players were disappointed with the government's decision to pull the team from the tournament, but they understood it, because Angola's government had yet to provide the team with extra security. The team wanted to play Monday's game, he said, but wanted a change of venue. If organizers were able to change the location of the game, then the team would push to play, he said. However, if there is no change of venue, the team, despite wanting to play, will respect the government's decision and leave the country, Dossevi added. Quoted by the national news agency, Dossevi said the players wanted to play to honor the dead. "We want to show our colors, our values and that we are men," he said. Speaking on Saturday, goalkeeper Kossi Agassa said it felt as if the players had "gone to war... It's deplorable for Africa. I don't know what other countries will decide, but it's hard. Too hard for us footballers." In a meeting Saturday, Angolan Prime Minister Antonio Paulo Cassoma assured African football officials that security would be beefed up for the tournament. Confederation of African Football President Issa Hayatou traveled to Cabinda on Saturday to meet Togo's squad as well as those from Ghana, Ivory Coast and Burkina Faso who are also based in the region, according to the CAF Web site. "You came here to play football but unfortunately two of your brothers were killed," Hayatou told the players. "It is left to you to decide to stay in a competition synonym of fraternity, brotherhood, friendship and solidarity. "And in case you decide to leave the competition, we will definitely understand your decision and it will be accepted. It is a difficult choice, individual choice and also collective choice, you are the only one can decide." An armed wing of a separatist group -- the Forces for Liberation of the State of Cabinda (FLEC) -- claimed responsibility for the attack and has threatened to strike again. CNN could not verify the claim independently. 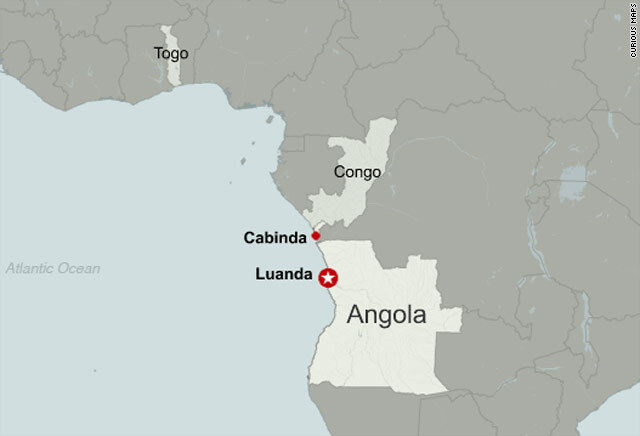 Angola, which was wracked by civil war for nearly three decades, brokered a peace deal in 2006 with separatists seeking an independent republic of Cabinda. Dossevi, who plays for French club Nantes, said armed rebels with AK-47s opened fire on the team bus. "We had just passed the border and a couple of minutes later we were attacked from both sides," he said. "We hid below the seats -- we had police protection in front and behind but we were attacked from both sides. As soon as I heard the bullets I went to the floor. ... The attack lasted for 10-15 minutes," Dossevi said. Angolan officials -- trying to assuage security fears that could dampen the war-torn nation's sporting aspirations -- vowed to heighten security, particularly in Cabinda. "We vehemently condemn the ignoble action, lament the loss of lives, and we reiterate our commitment to guarantee security," a government statement said, pledging that the Africa Cup of Nations would be "a great sporting event and a manifestation of friendship and solidarity among the African people." Hosts Angola played to a dramatic 4-4 with Mali as the competition began in the capital Luanda later on Sunday. The tournament -- one of the world's biggest -- is Angola's first major sporting event since a 2002 peace deal brought the southern African country's decades-old civil war to an end. It also marks the beginning of a year in the spotlight for African football, with South Africa set to become the continent's first country to host the FIFA World Cup in June. FIFA President Sepp Blatter said Saturday he had faith that Africa would meet the challenge of organizing one of the world's most watched sporting events. "My thoughts, and those of everyone at FIFA, go out to the victims of this terrible tragedy, and to their families and loved ones," Blatter wrote in a letter to Hayatou. "This awful event cannot dispel the fact that Africa has written some of the greatest chapters in the history of world football... I have faith in Africa, and it is with this faith that together we will organize world football's showcase event in 2010." Africa Cup of Nations: Headache or adventure?